We’ll blow your mind, you blow out the candles. Simma’s has an array of “conventional” cakes to suit all palates. All of our cakes are tortes with multiple layers of cake and filling. Although we provide a list of our more popular options, please fell free to customize your own perfect creation. Red Velvet cake with a cream cheese and butter cream on the outside. Chocolate cake with mousse filling inside and out. Genoise with butter cream and sliced strawberries in between and butter cream on the outside. Carrot cake with cream cheese butter cream filling and chopped walnuts on the sides. This cake contains nuts. Genoise with raspberry mousse filling and butter cream on the outside. Chocolate cake with Irish Cream liquor sprinkled on the cake with a ganache filling and iced with chocolate butter cream and chocolate covered. Hazelnut cake with apricot filling and chocolate butter cream in between the cake layers and chocolate butter cream in the outside. Genoise with lemon mousse filling and butter cream on the outside. Genoise with Irish Cream liquor sprinkled on the cake layers and Irish Cream mousse inside and iced with butter cream and dripped chocolate on the outside. Chocolate cake, vanilla mousse and ganache covered cherries in between the layers, with butter cream frosting. Genoise with cream cheese butter cream filling with coconut and pecans sprinkled in between the layers and then butter cream and cover sides with toasted coconut. Chocolate cake, ganache and raspberry filling in between the layers and iced with chocolate butter cream; cherry filling on the top with chocolate shavings. Chocolate cake with pecan/coconut filling iced with chocolate buttercream and topped with pecan/coconut filling. Banana cake with chocolate butter cream inside and ganache on the outside. Genoise with Grand Marnier flavored mousse and apricot filling in between the layers then iced with butter cream. Poppy seed cake with custard filling and butter cream on the outside with poppy seeds sprinkled on the sides and top. Genoise with custard filling and alternate apricot and raspberry filling and chocolate covered. 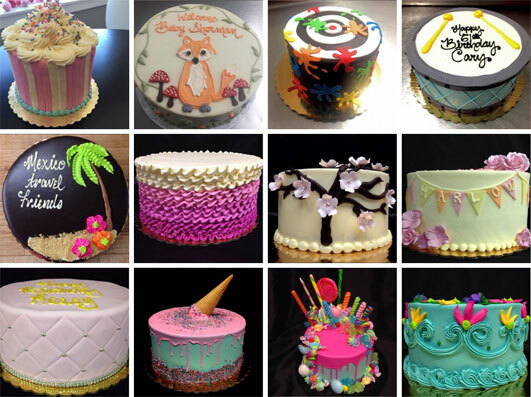 Because our cakes are customized specifically for you, please call the store for guidance. Please place your cake order a minimum of 1 week before your desired pick-up date. Thank You. If you wish to order a tiered conventional cake, we ask that you please call to make an appointment. Thank You.